The Internet of Things (IoT) is all around us. It is a network of interconnected everyday physical devices that use sensors to collect data, which is then analyzed to improve performance or enhance the user experience. During our Summits Program, Middle and Upper School students studied the IoT, and learned why data is so valuable and how data can be applied to better the world. The two-week course, which was taught by Ed. 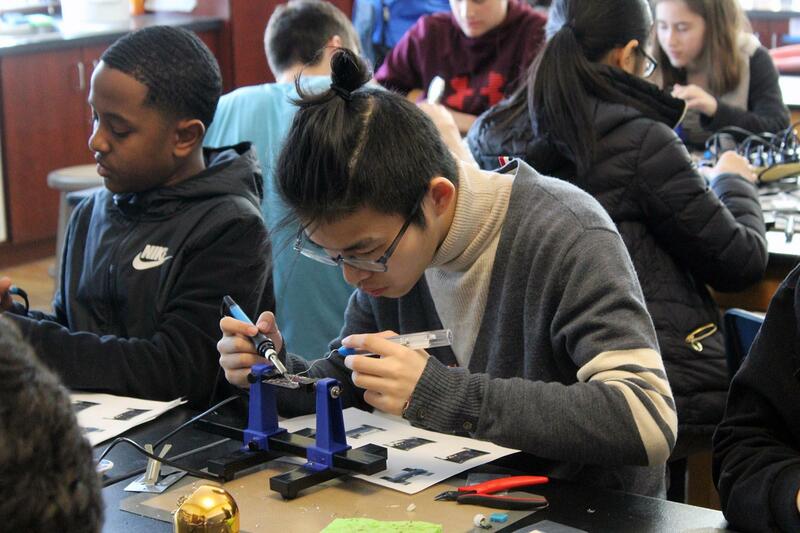 Tech Coordinator Shie Benaderet and Physics teacher Cecilia Tung, engaged students in soldering and creating their sensors, made form the Adafruit Feather Huzzah. Multiple speakers from the Seattle area presented to the class about big data, including Jim Loter, the director of digital engagement for the city of Seattle, and Marco Argenti, the vice president of IoT at Amazon. After the students built their sensors, they broke into pairs and researched ways in which collecting various data sets around Northwest could benefit the school. Ideas ranged from programming power outlets to save energy by powering down devices each evening to temperature and humidity sensors for the greenhouse in the Urban Farm and Garden. Maureen said taking IoT helped foster her interest in the STEM field, and she appreciated the all-day intensive classroom the Summit Program provided.